I'm sure most of my readers would have heard the Scottish Bagpipes at some time in their life. These magnificent musical instruments are made for the Highlands, where their piercing chords can reverberate across the mountains. It's no wonder this old instrument is still so well known and loved by many. My early memories of the bagpipes are from the welcoming of the New Year, when one of the residents of a beach I often stayed at would strike up the lyric of 'Auld Lang Syne' at midnight. The distinctive wailing sounds bounced off the ocean water creating an almost romantic effect. Amazing! However, I don't recommend you listen to the Bagpipes in an enclosed space. I recently heard a whole band of about 50 bagpipe players in a building. It was overwhelming; the musical equivalent of a barrage of exclamation points:!!!!!!!!!!!!!!!!!!!!!!!!!! I was grateful that I was near the entrance of the room, and could make a hasty getaway. · Conveying anger, scorn and disgust. · Indicating sarcasm and reverse meanings. · Underlining expletives and insults. Quite simply, an exclamation mark can make a short sentence, or even just a word, say a great deal more than you could without it. It's a Spartan way to use words to great effect. "All things in moderation' is a useful saying, but also problematic, since everyone has a different idea of what moderation actually means. Some publications (particularly newspapers) don't like exclamation points at all; others are more tolerant. How do you use exclamation marks effectively? · Exclamation points don't need to be completely eliminated from your writing, but use them sparingly. · There is no need for more than one exclamation mark at the end of a sentence. Using more than this is the sign of an amateur writer. · You seldom need an exclamation mark at the end of more than one sentence in a paragraph, so select the sentence that you want to emphasise the most. · Conveying irony or reverse meanings is usually best done with exclamation marks, such as in "Thanks a lot!" Without the exclamation mark, you would probably need to explain that you mean the opposite. · That very over-used phrase 'Oh My God' could seem like a pious statement without the exclamation mark to imply that you're not actually addressing the Almighty at all. (Of course, it could be used if you are addressing Him too, but you'll probably need to explain that you are, because this phrase is so often used without a skerrick of reverence intended). Exclamation marks don't need to be eliminated from your writing; but use it frugally for best effect. Part of content marketing is having optimized images for your blog posts. 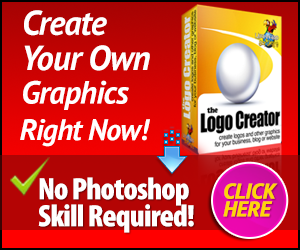 Well, rather than spend hours hunting down the 'perfect' one for your post or book cover simply create you own images with Logo Creator. And, you avoid possible copyright infrigment. I've been using this product for a couple of years now and love it (the image above is mine). 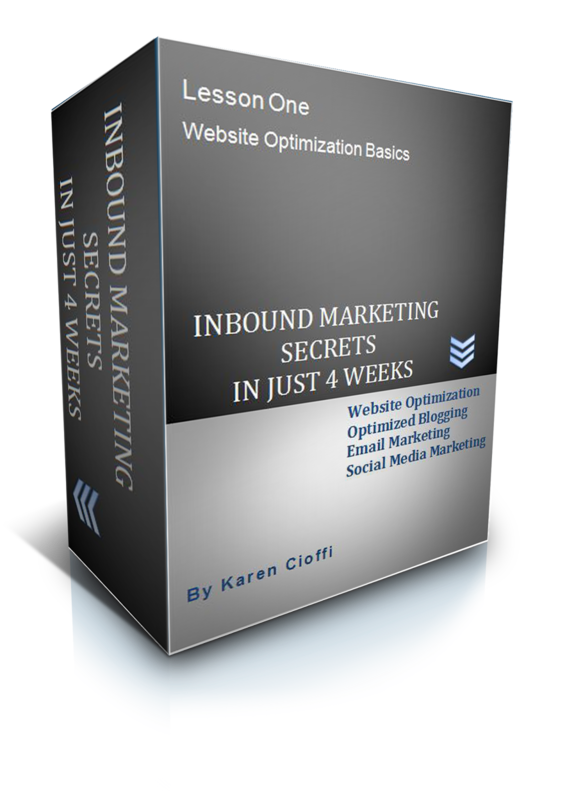 I use it for about 99% of my blog posts and I've used it for my ebook covers also. It's absolutely great and it's AFFORDABLE. Get started today. Just click the box! Search engines have the capability to trace everything, from keywords to tags, to your articles, to your comments, to your social networking participation. Everything you do online matters in regard to your SEO marketing efforts. Search engine spiders track your content marketing, your website, and even the number of visitors who click onto your site and the number of pageviews your website gets. A visitor, according to search engine analytics, is a person who actually visits your website. This is based on the visitor’s computer or device IP address and usually a cookie. A cookie is a text message given to a web browser by a web server. In other words, if you visit Joe’s Hot Topics, Joe’s web server will attach a cookie to your web browser. The browser stores the text message and it’s sent back to the server each time the browser requests a page from that server, in other words, each time you visit Joe’s Hot Topics. Also, it’s important to know that your own visits are included in those statistics, unless you exclude your computer or laptop’s IP address. For example, with StatCounter.com you’re able to BLOCK your IP from being counted in the statistics. This is an important tool. If I’m working on one of my sites, I may visit that site 10 or more times in one day. I wouldn’t want those visits counted in the stats for that site. A pageview refers to a view of a page on your website by a person/visitor. Factors such as reloading a page and moving to different pages count. There is much more involved in the analysis and calculations of these website metrics, but these are the basic definitions. The important factor here is that search engines can track everything, as mentioned above. And, they use that information to rank your site. The number of visitors who visit your site, the number of pageviews, and so on, all attest to the popularity and authority of your site. And, it lends credibility to you. The newest Google algorithm is kind of like a popularity contest for websites. The more visitors, pageviews, shares, and so on is what contributes to the ranking your site. Get high numbers and you’ll get more authority and higher ranking. If you’re a business or solopreneur, this will translate into more sales. Wow! This sent shivers down the spines of guest blogging content marketers. The problem is that with any authentic and trustworthy marketing strategy, spammers find a way to manipulate it to their advantage. This in turn makes is a less than favorable strategy for legitimate marketers. As an example, at least once a week, sometimes more, I receive an email from a writer, marketer, or whoever, who wants to send me an original, exclusive, on topic, article for my blog. S/he in turn would get a link in bio content. Because of these 3rd party shenanigans, the first thing I do is check the link they intend on including. They’re always to a 3rd party company. As a result of all these queries, I revised my guest blogging guidelines on my website – I no longer accept 3rd party links in guest posts. But, this is not to say that guest blogging should be thrown aside and trampled on. It means it’s up to the blogger to be aware of what’s going on with Google, what the ranking is of the site you’d like to blog on, and who is requesting to blog on your site. Guest blogging done for the right reasons still works. Also, if you’re a regular guest blogger on a high-quality site, you’re safe – this type of site can be considered a multi-author blog. The important thing to remember is that if you’re guest blogging on quality sites purely as a means to broaden your reach, make connections, and build authority it’s still a very effective content marketing strategy. If you’re an honest writer/marketer and use the system for legit purposes, you should continue to guest blog. Just be aware of the sites you’re blogging on and check out (or refuse) unsolicited requests to guest blog on your site. For more a more in-depth look on guest blogging guidelines, read the post at Hubspot.com. P.S. If you like this article, please SHARE IT. And, it'd be great if you leave a comment! Need to learn more about marketing your products and services? Website Optimization, Blogging Smart, Email Marketing, and Social Media Marketing. Plus a Bonus Lesson! It's an in-depth, interactive class - CLICK HERE to see all it includes. The great thing about using screen shots in your blog posts is it helps in conveying what you’re trying to get across. Adding visual aids to your articles lets the readers know you’ve taken the extra step to enhance their reading and learning experience. And, it's a great way to 'show' some social proof. With this one screenshot, I have social proof of my skills and authority as an inbound marketer. Note: The following four steps are for those who have a Windows Operating System older than 8.0. 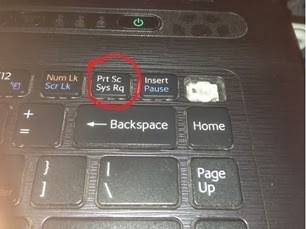 To add a screen shot, simple click on the “Prt Sc” button. It will take a picture of whatever is on your screen. Click on the Paint Button and paste (Ctrl V) the image into it. 3. Crop the image to how you want it. Then save it as a it as a JPG to a file. 4. Insert that image into a relevant post. Well, it’s pretty simple if you have an operating system lower than Windows 8. I upgraded to a new laptop and the operating system is Windows 8.1. Unfortunately, the PrtSc button doesn’t work. I even questioned how to get it to work in the Microsoft forum. It just doesn’t work. I was though, given a great tip: the Snipping tool. Snipping Tool is a ‘capture screen’ tool from Microsoft. It’s actually pretty cool, and it’s free. You simply download it to your taskbar. When you click on the icon, it gives you four options: free form snip; rectangular snip; window snip, and full screen snip. Whichever you choose, the image is put into a Snipping Tool box. You can then open Microsoft Paint and paste the image there, or you can paste it directly into a Word document, or you can save it to a file for later use in a blog post or somewhere else on your website. It’s not as convenient as the older version of PrtSc, but it does have more options. This is Part 2 of Online Marketing with Grassroots Visibility. Part 1 covered taking the time to learn the basics and the beginning of creating visibility. Now on to #2 in the grassroots visibility strategy. A. Create a website or blog - See Part 1. B: Bring traffic to your site. 1. Write regularly to your blog and make sure the content is valuable to the reader. 2. Write articles for article directories such as Ezine Articles, Associated Content, or Helium. Go to the site, create an account and then submit an article. There are a number of article directories you can use, just do a Google search. Be sure to write something that will be useful to others – if your readers feel your content is valuable they'll take that extra step and click on the link in your resource box. If you have no idea what to write or are intimidate about writing your own content, there are writing services that will write articles for you. These services might be listed as ghostwriting and/or blog and article content service. Be sure to check out their qualification (their articles and blogs) before hiring them. You can also take advantage of PLR - Private Label Rights. These can come in the form of ebooks which you can give away as your own. This is a great way to draw visitors and get them to sign up as subscribers. A word of caution here: be sure to read the ebook before you offer it as a freebie on your site; there may be errors in the content or outdated information that you will need to correct. 3. Once you have an article published on your website, share it to all your social networks, including: GooglePlus, Facebook, Twitter, LinkedIn, SutmbleUpon, and so on. Along with this, be active on your social networks. Share the posts of others and get in on conversations. 4. 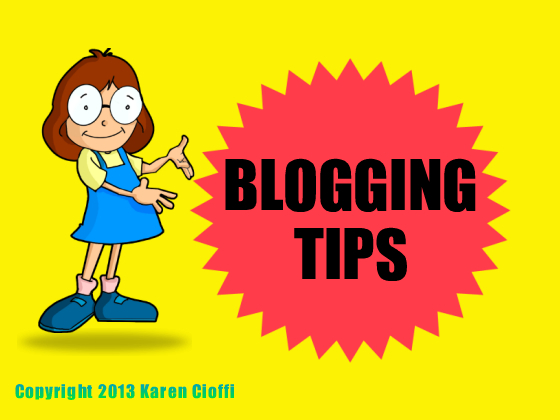 Visit other bloggers' sites and leave comments. Be sure to actually read the article you're commenting about so you won't be tempted to leave a generic response. If your comment is interesting or informative, the author or other commenters may click on the link back to your site. 5. Join in on a virtual book tour. If you're not promoting your own book, offer your site for authors who are. To offer your site you can post a notice on Twitter, Facebook and other groups you belong to. 6. Ask writers you know to do guest articles for your site.And, more importantly, research heavy-hitter sites as to their guest blogging guidelines. Send out some queries. 7. Be sure to join a couple of worthwhile forums and be an active member. This is a great source of networking. 8. Always include your URL as part of your signature. 3. You’re in it for the long-haul. These are some simple ways to bring traffic to your site and gain visibility. To keep your readers coming back you'll need to continue providing useful content. Don't feel overwhelmed; take one step at a time. Marketing is an on-going journey – just keep putting one foot in front of the other. P.S. If you liked this post, PLEASE SHARE IT! Well, we’ve gone over lots of strategies to optimize your articles and blog posts, but we didn’t really touch on blogging smart. To blog smart, you want to ‘prove’ to your visitors and subscribers that what you’re writing about or doing actually works. If you read this entire post, I’ve included lots of proof. This is what you should be doing with your blog posts, obviously not all at the same time, but mix and match. This is blogging effectively, and smart. And, this strategy will motivate the reader to model your processes. This is one of the best compliments. And, even more important, it will motivate the visitor/reader to say 'YES' to your CTA. My children's picture book is just 12 pages long, but I've been trying with this particular story for over a decade, pitching it to about 20 different publishers in that time, with no success. Finally I decided to try a competition. The fee included getting a professional appraisal (critique), and the first prize in its category is publication, by a royalty publisher. I was so excited to find out my entry was shortlisted, and the got into the finalists. Even more exciting, though, was the result of the appraisal. It was a lot more positive than I'd anticipated. I really felt like I had a win-win chance with this book. If I won the competition - fantastic! If not, the critique should help to sell the book to another publisher. We often think of a criticism as only a negative thing, but did you know that the word 'critique' comes from the word 'criticism'? A well-written critique really can be a writer's best friend. I was considering paying for a professional critique, so when I realised the cost of subscribing to the group (Omega Writers, Brisbane, Australia), plus the entry fee for the story, would work out about the same - especially as their critiques are also at a professional level - it definitely seemed a worthwhile investment. I don't usually consider competitions to be investments on their own; but a professional critique certainly can be. Does that mean that getting a critique, even by a professional, will guarantee success for you? Of course not. Some may not even be very helpful. However, it is probably better to take any negative comments seriously, especially if where they are accompanied by suggestions for improvement. The critique: the self-publishers best friend. Self-publishing has opened up wonderful opportunities for writers who simply can't get their books accepted by conventional publishing companies. It has also opened the door for some appalling writing to be published, which pulls down the reputation of self-publishing, and even writing in general. · I recommend any writers I know of who are considering self-publishing their book to get as wide a range of reader's critiques as possible, although you need to remember that friends and family are likely to be either overly nice or overly harsh. · Be willing to reimburse those who you ask to read your book, especially if you expect the person will give you a thorough and honest appraisal, rather than simply reading it and telling you how they feel about it generally. If you can't give a financial reimbursement, negotiate some way of showing your appreciation. Writers may love reading - but that doesn't mean they have time to appraise every hopeful writer's material for free. · Learn as much as you can about the process of self-publication and marketing before you pay a printer. · Approach a professional editor. If you know your writing skills are not at a top level, this is even more important. Even the best writers make mistakes. · You may also benefit from a professional appraisal at other levels, such as the story's flow, the strength of the characters, the plot outline and so on. Getting your book published may be easier now than ever before, but that doesn't guarantee it will be easy to attract readers. Do your best to get your work to the best level you possibly can, and people will be asking you for more. PS My little book didn't win the top place, so I shall have to keep trying. However, with a professional critique to accompany it, I know its chances are now much greater. Get in the writing game. Andrea Rains Waggener is a 3X large-publisher un-agented author – she knows how to get it done. And, she’s created a program that includes a 196-page e-book with all the information you’ll need to easily plan and write a novel that editors will jump at the chance to publish. Plus, there’s a 103-page taskbook, 5 1/2 hours of audio instruction, and more. This is a POWERFUL package of information to help you be the successful novelist you want to be. And, there’s a Money Back Guarantee.